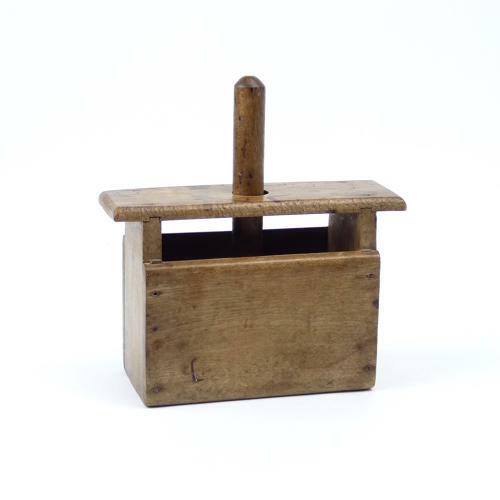 A really unusual wooden box for making a large block of butter. This piece is made in beechwood and dates from the last quarter of the nineteenth century. It works on the same principles as an ejector print in that you fill it with butter, chill it, and then push the butter out of the box, ending up with a large slab of butter with a design on the top. There are screws which regulate how far back in the box you can take the follower. In this way the piece was probably, also used as a measure. At first it appears that the box is quite crudely made as it is held together by small, brass pins. However, on closer inspection, all of the joints are also dovetailed so it is actually very well made. It is in excellent condition. Price includes postage within the U.K. Shipping to the U.S.A. add £55. Western Europe add £20.